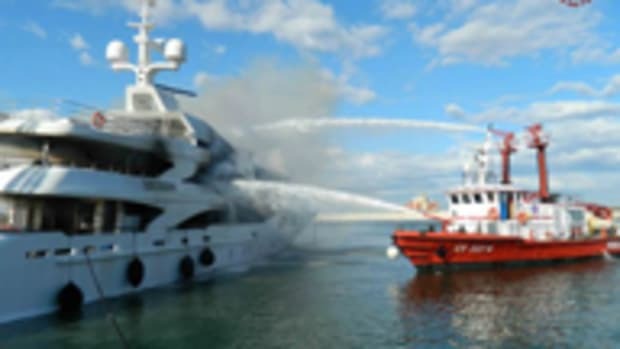 In light of a fire on a 183-foot yacht in the final stages of construction in its Livorno, Italy, boatyard, luxury yacht manufacturer Benetti said it has taken measures to avoid any other “extreme” problems. “The sense of responsibility and the passion of the Benetti team will make us [learn] from such an extreme case and reinforce the team commitment to continue to build, as we did in the last 140 years, beautiful Benettis sailing worldwide,” Azimut Benetti megayacht division CEO Vincenzo Poerio said in a statement. • An electrical storm affected Tuscany and, in particular, the Livorno area that night. • Protection against extraordinary electrical shocks, including thunderstorms, was not yet armed. • No one was sleeping on board that night to hear the alarms. The vessel will be taken out of the water and completed in a short time, the company said. Click here for video of the blaze.